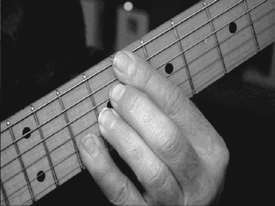 Michael: Welcome class, this interactive lesson covers part 4 of Understanding Chords. 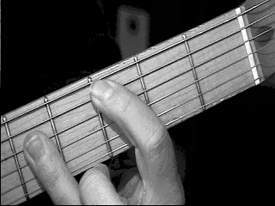 This section covers extended chords past the basic formula you learned in Lesson 1 (C Major scale, triads, arpeggios and how you turn them into chords). 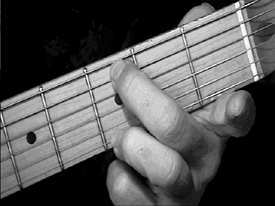 You also learned how to play the same chord on several positions of the neck as well. 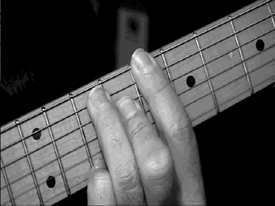 For this lesson you'll learn how to change the chord "voicing" by learning the extended formula for the Major, Maj7, Maj9, Maj11 and Maj13. 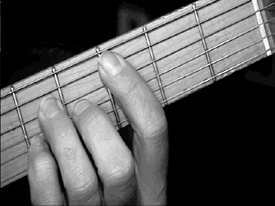 And how you can play each chord in various positions. 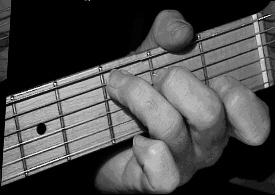 This will help you learn how to play chords outside of the standard Major chord. Michael: For the major you take the 1, 3, 5 notes of the scale and then if you want to play a Maj7 you use the 1, 3, 5, 7 notes and so on. It's basically a math formula. Music patterns and math are related. phil: How can you play the C Maj 13 ?? There are 7 notes if I read well. Michael: We'll get into this in more depth Phil, but you can leave out notes, such as the 3rd or 5th note giving you: C, E, B, D, F & A, thus leaving out G the 5 note. rockman: Does an 11th chord still have to include the 9th, teach?.......like in the diagram?......and so on etc..
Michael: Rockman, typically you would like to keep in key notes like the 9th. When you leave out or skip later notes they are called "add" notes. We'll work on that later, now, let's get into it. 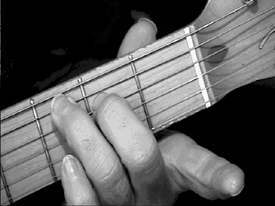 You can find the notes for the C Major scale all over the neck: C, D, E, F, G, A, B, this will help you visualize where you can figure out where the chords can be positions. First I'll give you all the notes and then we'll break it down into sections. rockman: C major....is that the Ionian? Michael: Yes rockman, don't let this first part overwhelm you click on the "guitar neck" link. Michael: Let's try the same thing in a different position. 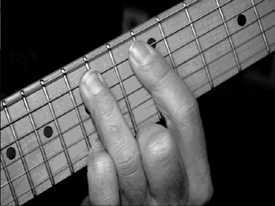 Michael: This is the basic of chords. 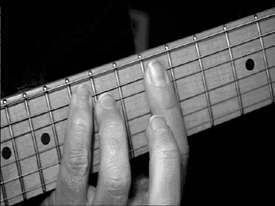 You get this and then you can figure out all kinds of chords, all you have to know is the formula I. E.; 1 3 5, 1 3 5 7, etc. mark6: So an E chord would be E-G-B? Michael: Can anybody remember what's in the C Maj7? Kelzan: C Maj 7 is a different chord than just C 7, correct? 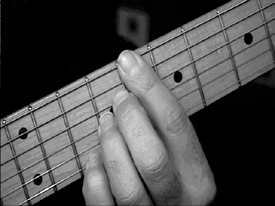 rockman: Does the Lydian fit over 7th chords, teach?... I've been leaning that mode lately. Michael: It does rockman, Does the chart help clarify this concept? Kelzan: It certainly helps, but it must take a lot of practice to see the patterns easily. Michael: Now let's move onto the Maj9, notice in our chart below you extend the C Major scale "two octaves" to visualize the formula for 1, 3, 5, 7, & 9. Michael: Now here are ALL the positions you can play the C Maj9 chord and arpeggios, use this as a reference to figure out your own chords. Michael: That's what I love to hear, that you are getting these concepts. 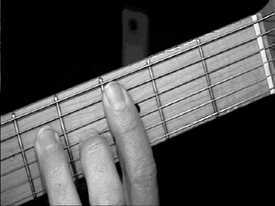 Michael: This will open the whole fretboard to you. 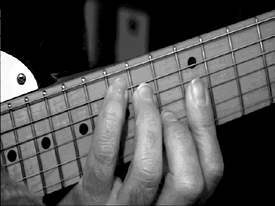 You will see all kinds of patterns, see how the "D" adds to this chord/arpeggio. 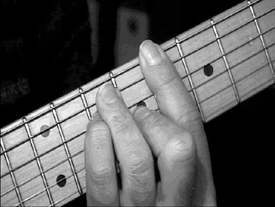 It's another cool chord used in jazz. phil: Do we have to play the 9 with only one finger ? Michael: You can find alternatives in the next tab files. Phil, yes, that is barred by 1 finger. jlancaster: Kinda like the POLICE (9ths) ? Michael: Jl, great ear, that's exactly what type of chords Andy Summer uses. I met him last summer and he is actually a jazz player, he thought it would be cool to play jazz chords in a rock band, while adding effects to his sound. 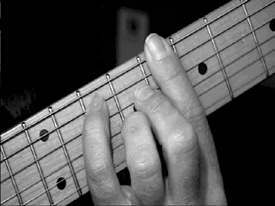 Dave Matthews is another great example of a guitar player who uses these chords, Hendrix too. lebaron: The major 11 patterns take up almost the whole neck? It's like all green now? Well, half anyway. Rhinosaur: You guys should check out Lyle Ronglien's modes lessons (Understanding Modes), they are good.. and relate to this stuff. mark6: It makes changes easier when you know the different positions. rockman: And if you knew all the chord positions, you'd know all the scales for those chords....right teach' ? Michael: Yes rockman, OK, class time to go, see you at the next Understanding Chords lesson! bye!